You are here: Home › Beauty › MEMEBOX #10 & GIVEAWAY! 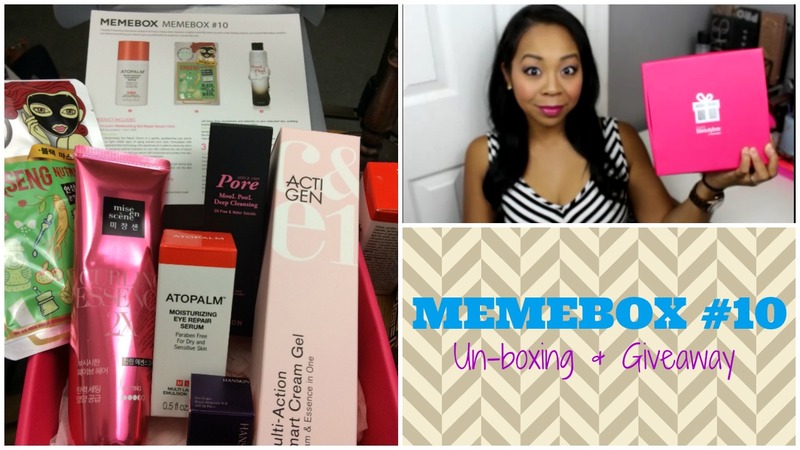 1 of 2 new unboxings and giveaways for Memebox Korean Products! The packaging and details of the information card show how much care and quality this company puts into their products! Korean beauty products have been highly recommended by so many friends of mine and these beauty boxes offer an inexpensive way to test and try different skincare, hair care and beauty products directly from well known brands in Korea. The value of the boxes outweighs the cost of the box itself and most times you will get 1 or several FULL SIZE products. Just watch the video to see how incredible their deluxe samples are and you will be wowed! Let me know if you try this out or if you have any products that you can recommend for me to try from their website! You can order and pre-order different editions of Memebox now! 33 Responses to "MEMEBOX #10 & GIVEAWAY!" I have never tried Korean products, but I’ve heard great things about them. Would love to win, so I can try! I have try korean BB cream. I have not tried korean products. I haven’t tried many korean products but the ones I have tried and the ones that I absolutely love are the Etude House Precious Mineral BB cream and for skincare, I love using the Etude’s House Wonder Pore Freshner Toner! Thank you so much for hosting this awesome giveaway! How exciting, never tried any Korean product before. I’ve purchased memeboxes in the past, so i’ve got a little experience with Korean products, I think it’s all pretty great, there is one BB that I own called Cellabel MC Recovery Balm SPF28 PA++, this stuff is SO incredible. I’ve tried only the brand Skinfood – not very impressed though. Thank you for this blog post & your great video. I enjoyed watching all the wonderful products you received. It would be amazing to win this so I could try.. But either way you defiantly got me wanting to get a MeMeBox of my own. I’ve heard so many great things & knowing the size of the products really makes it well worth the price! Thank you girl.. Lots of Love and Stay Amazingly Beautiful!!! I have my fingers crossed! Yes I have and the sail box is AMAZING!!! I’ve never tried any but I’m super curious about Tonymoly! Never tried any Korean Products. Always hear about them through you and other youtubers. Have a great day! I have never tried Korean products but I would LOVE to ! Sadly, No I haven’t tried any korean beauty products but I’m hoping this will be my chance. I have tried the face shop’s chia seed moisturizer. I love the gel texture, perfect for summer and really like the scent as well. I use Korean skincare everyday. I love the fermented skincare. I never tried any Korean product. I would love to try that!! !